Soda bread is a great recipe to have up your sleeve. Everyone will be astounded at how quickly you can rustle up some bread! Soda bread is traditionally made with wholemeal flour, but since I usually only have stoneground unbleached flour I generally use that. But this time it was different. You see, I am trying to use things up and clean out the pantry at the moment and there was a bag of buckwheat flour that just needed to be used. We were having leftover oxtail stew from the freezer (yes, cleaning that out too!) which we were going to turn into soup to make it go further so bread was the perfect thing to go with it. 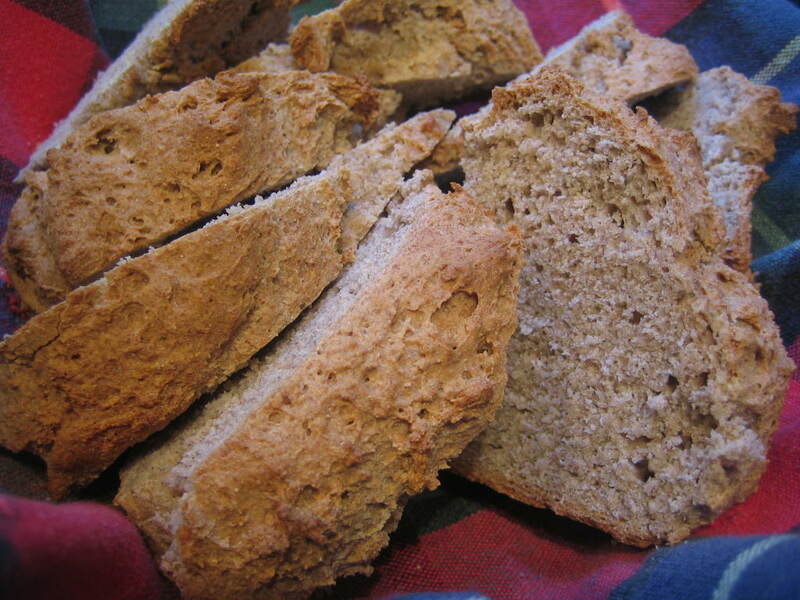 Soda bread is quick and easy enough make after work on a week night. And more to the point it was going to make the leftover oxtail stew seem a little more appealing. So from the frugality of not wasting anything and the obsessiveness of cleaning out the cupboards and freezer was born buckwheat soda bread, and what a joyous gift that was! I love the taste of buckwheat and it really shines in this bread. Soda bread has always seemed nuttier than a yeasted dough to me anyway and the buckwheat accentuates that wonderfully. Mix the dry ingredients together, then add enough buttermilk to make a dough, adding some water if required. Shape into a round loaf and slash a deep cross in the top. Bake at 220°C for 30 minutes then leave to rest for 15 minutes before slicing and slathering with fresh butter. Easy! You could make some fresh butter to go with this and use the buttermilk from the process in the bread to really feel like a domestic god(dess)! When I was in Christchurch last year I was surprised that it was so difficult to track down soda bread in bakeries or supermarkets. It's part of my staple diet over here in Ireland! I used to make a couple of wholemeal seed-crammed loaves a week and I always got amazing reactions from my NZ Boyfriend's family and friends. I like your buckwheat variation - must try it the next time I'm breadbaking.